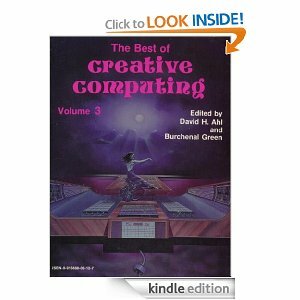 I sent the free sample of The Best of Creative Computing: Volume 3 (1980) to the Kindle app on my iPad 2, and I must say, speaking as both a historian and tech enthusiast, there are definitely some historical nuggets of genuine interest in there. The book was originally a 1980 release and collected more than 120 articles from the 1978 run of the legendary magazine. From the tone and content of the articles, you can definitely tell this was written for an unusually intelligent, sophisticated, and yes, geeky audience, which makes sense considering the type of individual who would be interested in computing in the late 1970s, and is a refreshing change from what tech magazines became from basically the late 1980s on as the potential readership expanded and the content had to be simplified accordingly.